What is a Distal Radius (Wrist) Fracture? The radius is the larger of the two long forearm bones that connects the elbow to the wrist. A distal radius fracture occurs when the end of the bone, closest to the wrist, breaks. This often happens when a person falls onto an outstretched hand. The distal radius fracture is the most commonly occurring fracture in the arm. Pain, tenderness, bruising and swelling following an injury in the wrist and hand, particularly a fall onto an outstretched hand. Stiffness or inability to move the wrist. 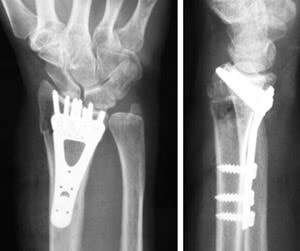 In a more severe fracture, the wrist may have an unusual bump or be positioned at an odd angle. If the fracture is complex or offset, a surgery may be need to position the bone in proper alignment while the fracture heals. Regaining mobility of the joints that had to be immobilized during the healing phase. Alternating heat and cold (a contrast bath routine) can be particularly helpful following a wrist fracture to reduce swelling and improve flexibility of the joints. Modalities such as ultrasound and electrical stimulation may reduce inflammation and pain. Techniques to reduce swelling such as using a compression glove or sleeve, electrical stimulation, use of cold packs, elevation of the arm. American Society for Surgery of the Hand (ASSH) -Website Information. American Society for Surgery of the Hand (ASSH) - 3 minute informational video.